An attempt to discuss every single product available for the Dungeon Crawl Classics Role-Playing Game. 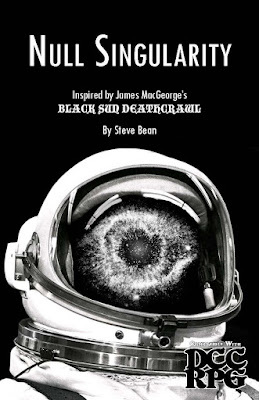 Null Singularity is a bleak adventure written by Steve Bean and inspired by James MacGeorge’s Black Sun Deathcrawl. Images are fair use or public domain. The publisher is Steve Bean Games. The author gives "Thanks to Lakobos Eight Fourteen who showed me a new view of The Void" and dedicates the product to "Therizo Nineteen-Sixty-Eight who has tethered herself to me, searching for the Way Past, even though there isn’t any". The product also contains XenoExegesis by James MacGeorge, author of Black Sun Deathcrawl. In this adventure you play a Voidant who encounters the Null Singularity and the Void. In this nihlitic adventure, there is no winning. There is only drawing out losing as long as you can, and with as much style as you can. If you've read my notes on Black Sun Deathcrawl, all the same applies here. Use it as a one-shot. Use it as a future that the PCs then have to try to avoid. Use it as a vision of hell. Regardless of how you choose to use it, it is a brilliant piece of writing. Life sought to flee from The Singularity. a place anathema to life. when compared to the Null Singularity. NULL SINGULARITY is an existential, space-horror one-shot compatible with the Dungeon Crawl Classics RPG. NULL SINGULARITY has players play a unique class, "Voidants:" the nameless crew of a primitive colony ship playing a doomed game of hide-and-seek with the dark, cosmological agent of the universe's destruction. NULL SINGULARITY plays in about 4 hours, including character creation, making it an excellent choice for periodic gaming groups and convention events. This blog has now moved to the OneBookShelf affiliate system. So, if you follow a link from here to RPGNow or DriveTrhuRPG and then make a purchase within the next 15 days, 5% of the purchase price (minus gift certificates) will be credited to my account. It costs you nothing; you can consider it a tip. The link can be adjusted in your browser to remove the affiliate tag, if you so desire.